Mega Sale! Free Shipping Included! Save 26% on the Ravi (30030) Solution Instant Wine Chiller by Ravi at Verve Wine Bar. SKU: RAVI-2. MPN: RAV1B. Hurry! Limited time offer. Offer valid only while supplies last. Ravi is based on the innovative concept of cooling wine at the very moment it is served. It is not the bottle that is cooled, but the wine itself. Ravi is based on the innovative concept of cooling wine at the very moment it is served. It is not the bottle that is cooled, but the wine itself. The cooling process takes place as the wine passes through an internal tube in the Ravi. Use of the valve allows you to regulate the amount of time the wine is cooled. The internal tube of the Ravi is made from the same stainless steel used for wine fermentation tanks and maintains the wine’s characteristics and never alters the taste. The Ravi will cool wine within seconds which means no more waiting and no more messy ice buckets to contend with. Since not all wines are enjoyed at the same temperature, Ravi has a valve that controls the flow of wine to regulate the temperature. Store the Ravi in the freezer, when needed place the Ravi into your wine bottle and in mere seconds you can savor your wine cooled to exactly the right temperature. Unfortunately, red wines are usually served too warm and the alcohol tends to predominate, concealing the fruit of the wine. 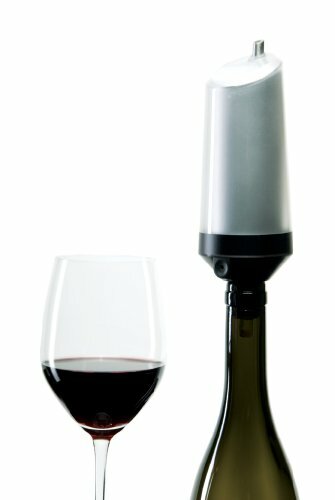 Ravi enables your wine to instantly go from room temperature to that of a wine cellar. When enjoying a white wine or a rose, the Ravi can cool your wine to perfection. The Ravi was born from two years of work with oenologists, designers and other wine-making specialists. To use, simply keep the Ravi in the freezer so it is ready to go. When needed, insert the Ravi into the bottle neck as you would a cork, and pour. The wine is chilled as it passes through the frozen stainless steel tube. The air hole or valve allows you to control the temperature drop. Covering the hole slows the flow of the wine, the more time it spends in the Ravi, the colder your wine will get. Hand wash. Made in Canada. If you have any questions about this product by Ravi, contact us by completing and submitting the form below. If you are looking for a specif part number, please include it with your message.